paintjob. Bust made of resin foam filled. 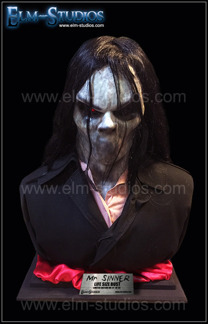 Synthetic hair and real clothing displayed on a wooden base with a metall plaque. The bust is about 23 inches tall including display base. Weight around 11 pounds, 6 kg. Takes about 2-3 weeks to complete after payment has been made.